The biggest problem I see in Illinois is prosecutors unwilling to hold government officials accountable. State’s Attorneys across the state refuse to do their job. Equal justice under the law doesn’t exist. I don’t know if its lack of staff or just being afraid to upset the status quo. Here’s the latest example – it’s a little technical, but hang with me. Every law enforcement officer is required to qualify with a firearm once a year. Reports MUST be filed with the Illinois Law Enforcement Training and Standards Board. It’s the LAW. Robert Davies – former assistant police chief. Note the PTB ID number required on the Roster. See the BlnNews story above. Robert Davies hasn’t had an active number since 1982. The Roster is supposed to list ALL agency personnel. Gary Hartzell needs to explain why Robert Davies was allowed to carry a gun and pretend to be a police officer when he obviously knew Davies wasn’t qualified since he was never on the Roster. Gary Hartzell reported that he did his firearm qualification on 6/7/16. Did he? Of course, Robert Davies isn’t included either. Gary Hartzell reported to the State that he re-qualified as required by law when there is no proof he really did. 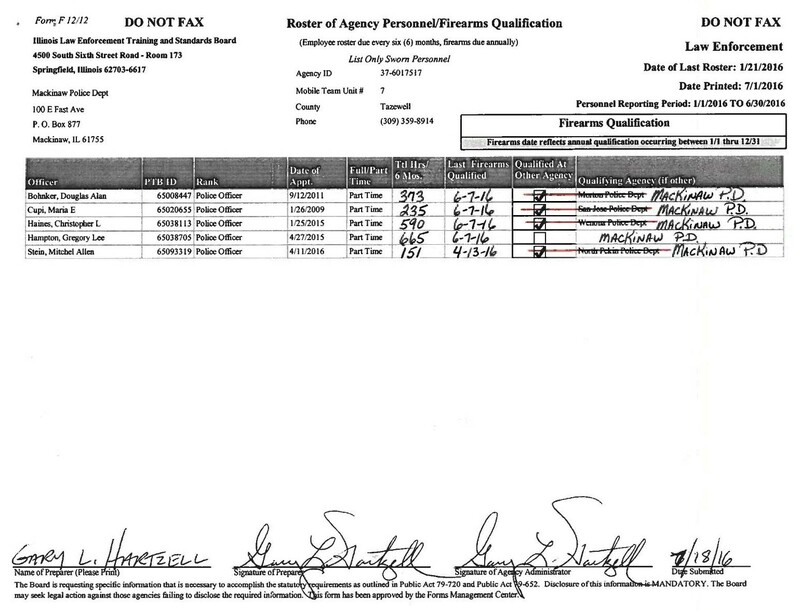 In case Hartzell claims not including his sheet was an oversight – I also have the sign-in log for 6/7/2016 at the range showing he never signed in. I picked 2016. It’s not the only year he reported he re-qualified when there is no evidence he ever did. How is what Hartzell did not Fraud? Falsifying an official document? Official misconduct? Pick a crime, any crime! What crime did he commit by knowingly allowing Davies to pretend he was an officer? Worse, both Hartzell and Davies were wandering the streets of Mackinaw with firearms the weren’t qualified to carry. 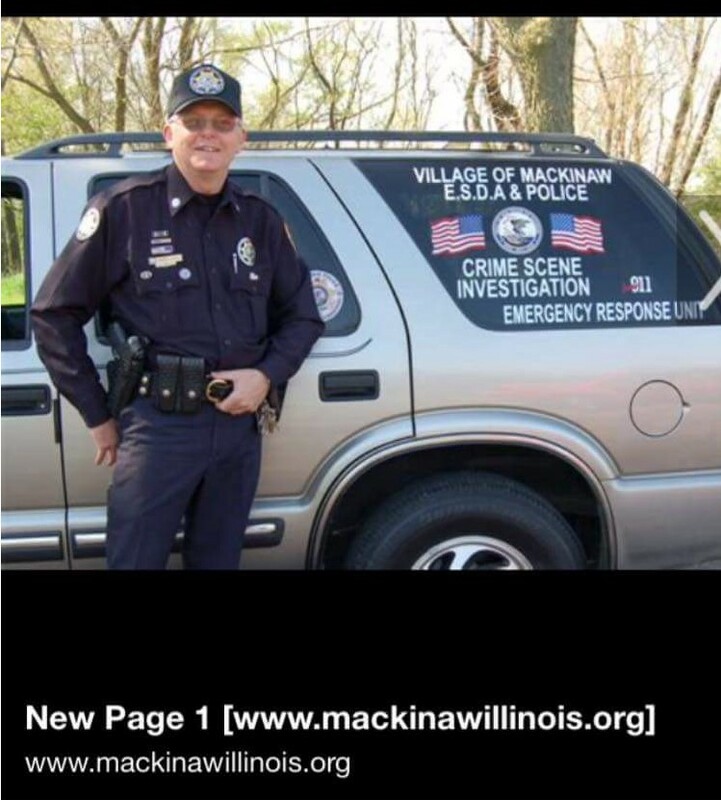 The Village of Mackinaw should be terrified that anyone ticketed or arrested by Davies will sue. I have been in touch with the Illinois State Police. They don’t want to waste their time investigating if the Tazewell County State’s Attorney has no intention of prosecuting. There is another twist in this story. I’m letting the Edgar County Watchdogs write about it. I will link to it when they do. Posted in BloNo, Local.Tagged Firearms qualification, Gary Hartzell, Illinois Law Enforcement Training and Standards Board, Mackinaw, Robert Davies, Tazewell County, Tazewell County State's Attorney. What can citizens do to right this wrong? Who can we call? Demand the Tazewell County prosecutor do his job! I am losing faith in the Edgar County Watch Dogs. They are not experts in government and at times are only a bluff due to their vast ignorance of some phases of government . Seriously? What are you talking about? They can’t prosecute anyone, they know more about the law than most lawyers. They prove it time after time.